My DH doesn't eat breakfast. I want my DH to eat breakfast. Breakfast should not be skipped. Breakfast is indeed the most important meal of the day. My DH eats more junk food in the mornings, because he hasn't had a good breakfast. I want to stop nagging him about eating breakfast. So, I went in search of solutions...well actually, they started coming to me. I was making breakfast for the littles one morning a few weeks ago, when my stomach started to rumble. I usually don't eat until they've eaten...typical mom. I was mourning the fact that we didn't have anymore freezer waffles. 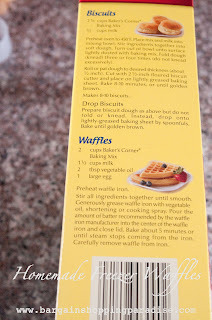 I buy the buttermilk kind just to have on-hand for a quick grab-n-go kind of breakfast...don't judge! Haha! But, alas, we were out. Then, out of nowhere, it hit me! 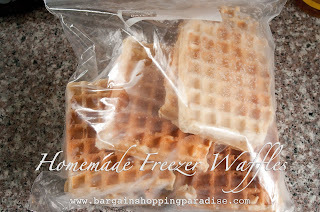 You can make just about anything (ala Pinterest), so I'm SURE I could make my own freezer waffles! 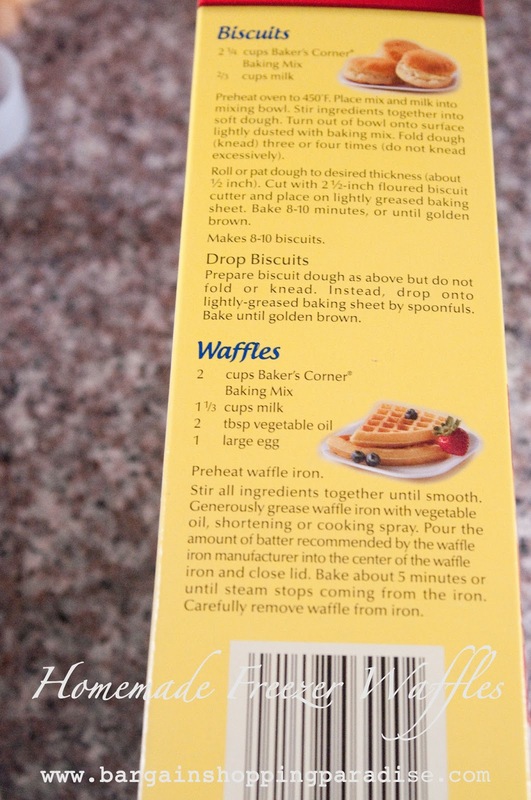 I mean, wouldn't that just mean making up a whole bunch of waffles and, uh...freezing them?! Duh! I have no idea why I never thought of this before. Times are tight, and wouldn't that save me even more money, anyway? Of course! So, I got to work! I man, why waste time when brillance strikes? I grabbed my multi-purpose baking mix, and just followed the instructions. I add a bit of Red Mill Wheat Germ, just to give them some good grains. I already had all the ingredients on-hand. Most all of you will too! After firing up my trusty, not-so-fancy Westinghouse waffle iron, I just cooked them up. It takes only about 3 minutes each! I'm regretting the fact that I didn't take any pictures while I was actually cooking them, but after you cook them, simply place them on a cookie sheet lined with wax or parchment paper, and stick them in the freezer for at least 4 hours. After that, just put them in a gallon-sized plastic freezer bag, and you're all set! 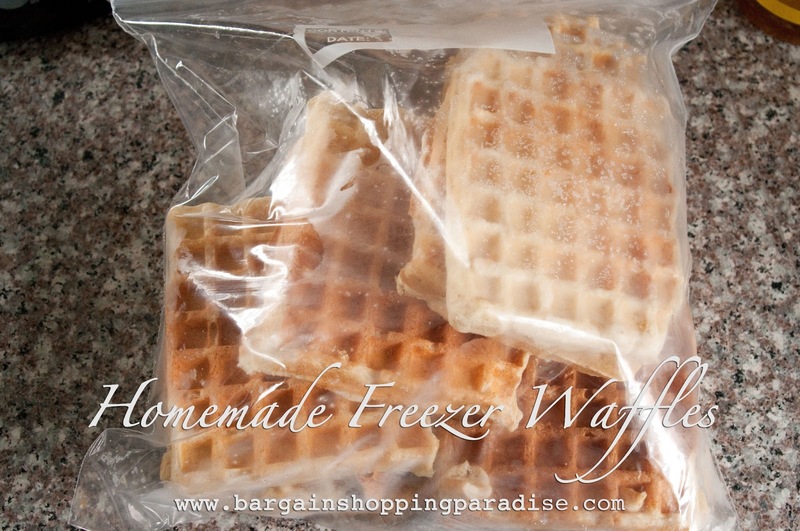 Toast them up when you're ready to eat them, just like you would with a regular freezer waffle. YUM!! So, when my DH is getting ready to leave the house, he can either grab a couple of these and eat before he goes to work, or take them with him and heat them up there. Honestly, I grab them too, when I need a quick breakfast! They're so tasty, and I feel like I'm getting so much more out of them than I was out of the pre-packaged freezer waffles. Quick breakfast solution #1...complete! Now on to quick breakfast solution #2--"Make-Ahead, Healthy Egg McMuffin Copycats" that I saw on Pinterest. Stay tuned for that post on Thursday!